Abrasive grit encapsulated into the extruded nylon filament allows an abrasive nylon brush to perform deburring, edge blending, and surface finishing. 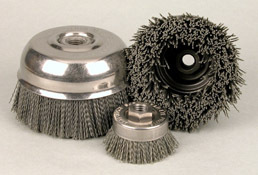 Abrasive brushes in power brush or wide face cylinder brush format deliver the flexibility and conformability of a brush, while also imparting the benefits of an abrasive: selection of grit sizes to control finish, and functionality for deburring, cleaning, surface finishing, and edge blending. Abrasive Nylon is suitable for use on a broad range of materials. Wheel brushes: Deburring, surface preparation and removal of coatings without affecting the geometry of the underlying surface. Abrasive wheel brushes provide a linear brushing path. Cup brushes: Deburring and surface finishing where the multi-directional brushing action of an abrasive cup brush is desired to reach a variety of surfaces from different directions. End brushes: Using the sides of the filaments as flexible files, abrasive end brushes can clean internal surfaces and deburr internal threads. A bridled end brush can be used to deburr or clean a confined or hard to reach area. Cylinder brushes: Abrasive Nylon filled cylinder brushes are used to scrub surfaces of sheet or coiled metal before subsequent coatings or treatments are applied. Custom design allows tailoring of brush to exact requirements of process. Strip brushes:Overhead conveyor rails, both I-beam and enclosed styles, and the chain trolleys involved in powder costing and painting operations need to be kept clean to minimize contamination of the conveyed product due to debris from above. Custom designed abrasive nylon strip brushes can be mounted to continuously clean the moving chain trolley, or can be mounted to travel the full length of the conveyor line to perform I-beam or enclosed track cleaning as an off-line operation. Centerless Grinder brushes: Suitable for use in throughfeed centerless grinders in place of a grinding wheel. Abrasive nylon filaments provide deburring and polishing of the cylindrical workpiece in a single step. This wide face brush can be designed to deliver a medium grit on the entry side and a fine grit on the exit side. Tube brushes: Power driven tube brushes filled with Abrasive Nylon aid in deburring threaded holes and interior surfaces, including cross-drilled holes. For many dry industrial applications Nylon 6-6 is acceptable, while more demanding applications may require the additional heat resistance, lower water absorption and increased toughness of a Nylon 6.12. Both Silicon Carbide grit and Aluminum Oxide grit are available, and approximate a 30% loading by weight in the extruded nylon filament. Silicon Carbide is more commonly used because it is harder and sharper than aluminum oxide, and it is preferred for finishing ferrous metals. Aluminum oxide grit is less likely to fracture and is preferred for finishing softer metals including stainless steel and aluminum, wood and plastics. Aluminum Oxide also eliminates the small risk of contamination of the stainless steel or aluminum surface by free carbon deposits from the silicon carbide. Different from a typical wire brush, where the operating guidance is to use the tips of the wires to do the work with light pressure and high brush face speed, abrasive nylon brushes abrade with the sides of the filament as well as the tips because the grit is spread randomly throughout the filament. As a result, lower brush speeds and greater engagement of the work-piece into the brush face may contribute to increased brush effectiveness. A work-piece requiring finishing of contoured or recessed surfaces can be accommodated with a longer trim brush, controlling the brush speed, and by engaging the work-piece into the brush face up to 1/8th of the length of the brush trim. Speed: Abrasive Nylon Brushes are generally safety rated at higher Manufacturers Safe Free Speed (RPM) than their suggested operating speeds. Recommended maximum dry operating speeds approximate 3,500 surface feet per minute. Request our surface feet per minute chart for correlation to wheel brush diameters. When abrasive nylon filaments are operated at excessive speeds, the brush tips tend to soften or melt, causing streaking of the molten nylon on the work surface. The use of a machining coolant or cutting oil is recommended to control smearing in the higher speed ranges. Softening of the nylon filament due to exposure to coolants and oils will occur to a greater extent with Nylon 6-6 than with nylon 6-12 due to its higher propensity to absorb moisture and lower resistance to various solvents. Other grit sizes and filament shapes are available, subject to stock condition and minimum purchase requirements. ©2019 Spiral Brushes, Inc. All rights reserved.